One of my favorite health tracking products on the market right now is myfitnesspal. I evangelize it to nearly all of my friends and family as the most highly specific and detail focused health tracker on the market. However this introduces an intriguing UX challenge. 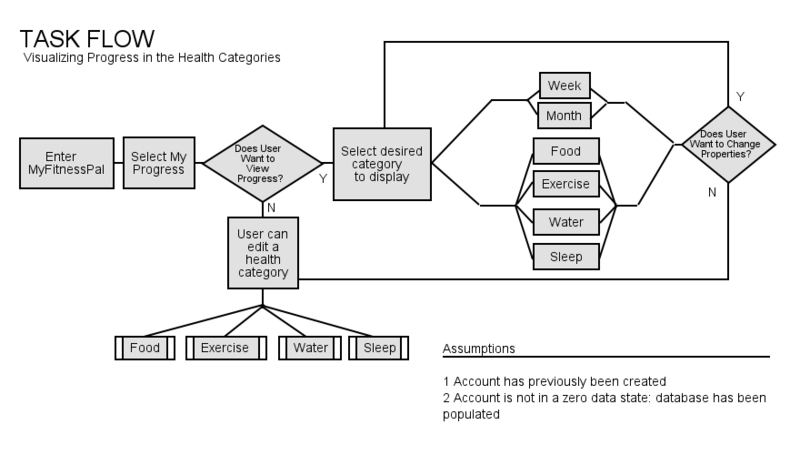 How as designers can we craft a product that despite a high level of work investment from users, the percentage of new data entered is maintained/increased, and health trends and insights are clear and accessible. Enter my proposed feature change to the myfitnesspal web app– the visual dashboard. On the myfitnesspal website, health progress and goal achievements are displayed via text fields, embedded amongst and array of ads, buried between the major navigation, secondary navigation and a utility/social media navigation. 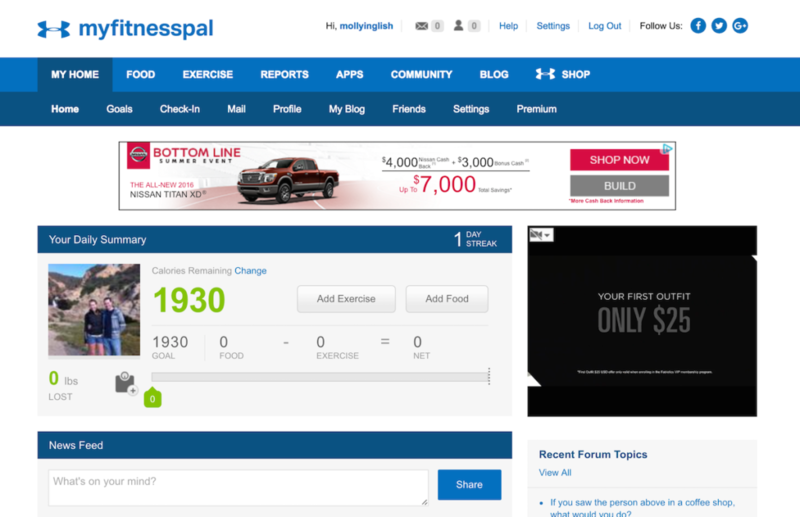 Below are screen shots of the current myfitnesspal website. My hypothesis is that the equation visual is not as powerful as a visual dashboard. Beth, is a mother of two girls, who’s life is hectic and unbalanced. 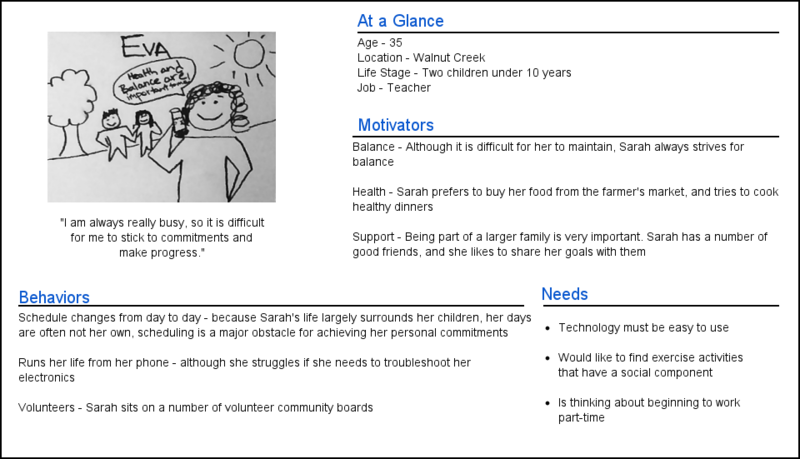 She has a number of specific life constraints (facts), behaviors, goals & needs that guide the design of the visual dashboard. From the Beth’s persona I am able to then turn to detailed design stories to create better, more complete designs. Detailed design stories help ensure that all potential use cases are identified. Once identified, it is easier to evaluate the most important and less important functions and therefore which features to include/disclude. Beth wants to track and view her health progress. Beth wants to share her health progress (not addressed in MVP). Below is a demo video, demonstrating a prototype of the visual dashboard. © 2019 UX + Molly All Rights Reserved.